Seton Humancare — Kevin Taylor — Award Winning, Tampa Based Creative. To a lot of people, the chance to rebrand a hospital might not sound like a huge creative opportunity. But a few illustrated robots later, I'd say we proved that wrong. We created a :90 animation (which, in the advertising world, feels like making a feature film). Then, we launched a fully integrated brand campaign for Seton, the largest family of hospitals in Central Texas. It makes a statement about the broken state of the healthcare system – that it needs a human touch. It's all about "Humancare." After the brand launch, we created materials for their children's hospital, their new teaching hospital, and various health segments. The campaign is still a living, breathing thing, coming to life in new ways every month. This app was a concept idea that allows good samaritans to easily find volunteer opportunities and invite friends via social media. 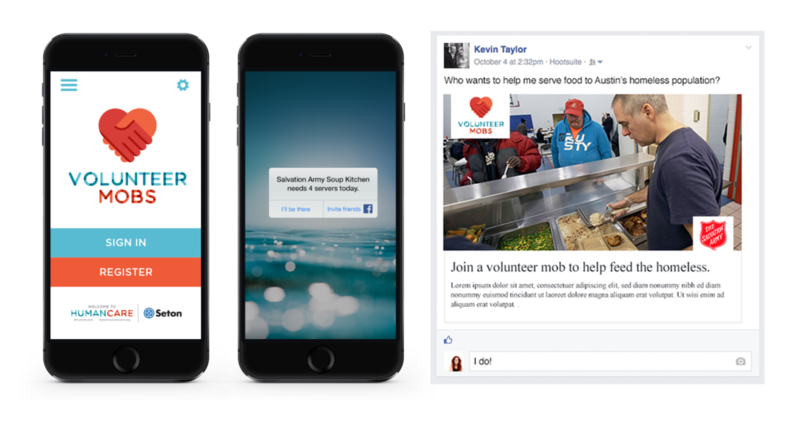 Using Facebook Connect, it can see users interests and suggest volunteer opportunities. Anyone who wants to gather a group of people to go do a random act of kindness can create a volunteer mob with the push of the button, which will send out push notifications to those who have opted in. Organizations can also send out alerts when they need volunteers quickly. © Copyright 1998-2018, All Rights Reserved.